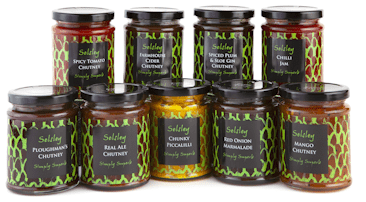 Our wide range includes some unusual flavoured products and has recently been expanded to include a small selection of premium quality Gourmet varieties. The herb/spice theme runs through much of the range and new varieties are continually being developed. This wonderful chutney tastes and smells as good as it looks. Whole spices send this fruity chutney into orbit. This Chilli Jam is full of wonderful flavours and has plenty of body. Sweet and savoury at the same time this product takes cheese on toast to new heights, is amazing with cold meats and salads, but my oh my! is it good with barbequed food! Very popular stalwart of our range – mild flavours, good with anything. This perfectly balanced piccallili is a traditional accompaniment to Cheddar cheese and cold meat, particularly pork pies and meat terrines. Our version of this mustard pickle is a perfect blend of crunchy vegetables, vinegar and mustard. A fine ale and the richness of English Country produce make our Real Ale Chutney an all-rounder on the plate and a kitchen cupboard staple. A perfect combination of sweet and savoury, this product is wonderful ladled warm over a juicy steak or served cold with sizzling sausages, pate, cold meats and cheeses. This sweet chutney infused with spices will add flavour and body to many dishes. Works really well with Mexican and Mediterranean food, or simply with crusty bread and cheese.